The Stanley Wiater archive of Modern Horror literature comprehensively documents the history of the genre. Mr. Wiater has been a writer, editor, anthologist, journalist, and collector for over 40 years. He is a four-time nominee — and three-time winner — of the Bram Stoker Award, the highest honor given by the Horror Writers Association. (He has also been nominated for a Hugo, Locus, Rondo, Harvey, and Eisner Award, among others.) He is widely considered the world's leading authority on Modern Horror writers and filmmakers, and he became a friend to virtually all of the former and many of the latter. He has spent decades both contributing to the field and making its writers and their works accessible to others. Modern Horror emerged as a field in the late 1960s and early 1970s, with the movies Rosemary's Baby and The Exorcist followed by the sudden and unprecedented success of the horror novels of Stephen King, who reportedly became the bestselling novelist in the world. Stanley Wiater began collecting classic horror and adventure novels in the early 1960s and when the horror genre took off he was well-positioned to appreciate it. As a journalist his first assignment, in 1974, was interviewing Ray Bradbury, author of a number of classic works of science fiction and dark fantasy and considered one of the fathers of Modern Horror, so Wiater has been documenting the field essentially since its inception. Correspondence files and interview transcripts covering the leading figures in the field. Wiater's first Bram Stoker Award winner was his book Dark Dreamers: Conversations with the Masters of Horror , and a unique element of the archive is the collection of audio and video tapes of his interviews: Wiater has interviewed and recorded more major writers in the field than anyone else, and the unedited tapes and transcripts of the interviews are an unparalleled resource for studying the field, as the published versions of them represent only a fraction of the overall interview content. There are well over 200 hours of audio tape interviews, including talks with such acclaimed writers as Bradbury, King, Clive Barker, Richard Matheson, Robert Bloch, Harlan Ellison, Ira Levin, David Morrell, and many others, and in Dark Visions: Conversations with the Masters of the Horror Film with filmmakers such as Roger Corman, David Cronenberg, George Romero, Sidney Pollack, Martin Scorsese, and others. Most of the material on the tapes has never been published. Left: Horror fanzines from the 1970s and '80s; Right: Poster of the cover art for one of Wiater's books. In addition, Mr. Wiater developed the interview format for television, and the original series, also called Dark Dreamers , debuted on Canadian and British TV in 2000. 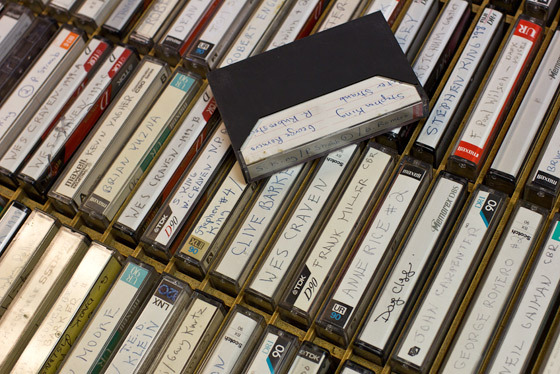 There are over 150 raw, unedited video tapes; the shows, when produced and aired, were 24 minutes long, meaning that the vast majority of the contents of the tapes has never been seen. Interviewees include Barker, Ellison, Matheson, Romero, Peter Straub, artist Gahan Wilson, director Wes Craven, among many others. Mr. Wiater is a knowledgeable and sympathetic interviewer, and his questions regularly elicit long, interesting and revealing answers from his subjects. It is doubtful there exists anywhere a repository of such unpublished and unseen primary source material as this. The archive contains many manuscripts of novels, anthologies, and interviews; published and unpublished. The archive includes a large number of manuscripts — Mr. Wiater's own and those of the writers he anthologized or edited; a substantial amount of business and literary correspondence from virtually all of the major and minor writers in the field, as well as the early paper archives of the Horror Writers Association. Anne Rice interview excerpt, 1988. Anne Rice interview excerpt #2, 1988. Dean Koontz interview excerpt, 1988. Stephen King & Peter Straub interview excerpt, 1984. 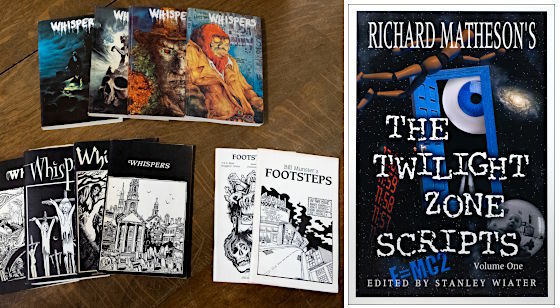 In addition to Dark Dreamers , Mr. Wiater has edited two anthologies of original fiction by nearly two dozen writers, as well as critical books on Stephen King, Brian Lumley, and Richard Matheson's classic Twilight Zone scripts, which helped establish that show as the gold standard of serious, thought-provoking television in the early years of the medium. He also compiled his second Bram Stoker winner. Dark Dreamers: On Writing , as well as a collection of photographs (taken by award-winnng photographer Beth Gwinn) as Dark Dreamers: Facing the Masters of Fear . Mr. Wiater also co-authored Comic Book Rebels: Conversations with the Creators of the New Comics , the definitive treatment of the growth of the underground comix movement in the 1980s and beyond. Wiater's own fiction manuscripts are included, both published and unpublished, including his first published story, which won a contest judged by Stephen King. Mr. Wiater's archive is that of a writer with a unique position in the Modern Horror "family." The archive is diverse and wide-ranging, coherent and comprehensive, broad in sweep and with great depth in both published and unpublished materials. There is no other archive that documents this genre of popular literature as intimately and thoroughly as does Mr. Wiater's archive. The archive is priced $150,000. An inventory of the archive is available here. For more information contact Ken Lopez Bookseller at 1-413-584-4827 or mail@lopezbooks.com.